Budget airline easyJet has announced it took a £15 million hit from the drone chaos at Gatwick Airport before Christmas. Drone sightings repeatedly caused the London airport to close between December 19 and 21 last year, affecting around 82,000 easyJet customers. The airliner said it booked £10 million in extra costs and a further £5 million in lost revenue after more than 400 flights were cancelled. 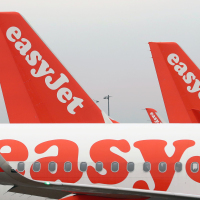 Chief executive Johan Lundgren said easyJet did everything it could to help customers affected by the incident. Mr Lundgren said: "There has been a one-off cost impact from this incident, but underlying cost progress is in line with expectations. "I am proud of the way our teams worked around the clock to mitigate the impact of the incident and looked after affected customers." But Mr Lundgren said the incident was a "wake-up call" for airports. He said: "We were disappointed that it took a long time to resolve. "You can't always protect yourself from that, but it's a wake-up call and airports will be better prepared going forward." In its first-quarter update, the group said it was "well prepared" for Brexit and had not seen an impact on passenger bookings ahead of March 29. It added: "Both the EU and the UK have committed to ensure that flights between the UK and EU will continue in the event of a no-deal Brexit." Mr Lundgren said: "For the first half of 2019, booking levels currently remain encouraging despite the lack of certainty around Brexit for our customers." But the first quarter saw a lower-than-expected rise in passenger capacity to 24.1 million seats due in part to the drone disruption. Overall the group said full-year expectations are "broadly" in line with market forecasts. If you're heading off on holiday this year, check out our annual travel insurance options and find cover that's right for you.